Photo effects in Photoshop Elements 11 work like applying filters; whereas the Filter Gallery dialog box provides you with many options to apply a filter, the Guided panel offers you filter effects and then takes you through steps for adjusting brightness values, changing hue and saturation, and making other adjustments to perfect the result. Depth of Field creates a sharp and blurry lens effect. Low Key creates a dramatic, dark toned, chiaroscuro (Italian for “light-dark”)-type image. Line Drawing converts your photos to a pen-and-ink drawing. Lomo Camera Effect creates a cross-processed, vignetted effect. High Key creates a light toned image of mostly white and grays. Click the Diffuse Glow option to create an even more dreamy photo. Old Fashioned Photo gives your images a vintage, sepia appearance. 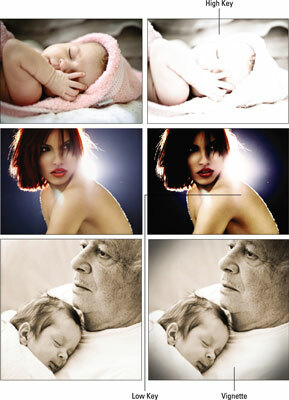 Orton Effect gives a dreamy quality to your image by softening the focus and overexposing the image. Saturated Slide Film Effect simulates the colors of saturated film used in film cameras (as opposed to digital cameras). Tilt-Shift effect creates a miniaturized effect by adjusting the focal plane. Vignette Effect creates a darkening or lightening at the corners and outside edges around an image.